"...he goes to Las Vegas to this debt-buyers' convention..."
Listen to Jake Halpern for about a minute, and you'll see where the incredible energy in 'Bad Paper: Chasing Debt from Wall Street to the Underworld' comes from. This is one of those interviews where you'll hear his voice reading the book to you when you pick it up. If you wonder what exactly is meant by "coiled energy," Halpern's voice is a great definition. 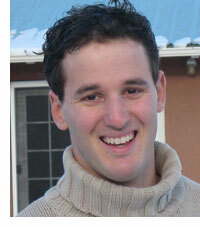 Halpern combines that great voice with an equally great storytelling sensibility. His speaking and his prose voice are used to best advantage to take you on a journey to a world within our world that you might not ever have suspected could exist. I will warn readers that hearing this interview is very likely to make you want to buy and read the book. To me it has all the makings of a classic. Jake and I talked about some of the nuts and bolts of the book, and some of the stories in the book, but as well we discussed the how and why of writing the book. In both cases, he's a great storyteller, offering insights into his characters as his means of creating them. The story behind the book is nearly as wild as the story within the book. While you'd think all this reportage is just a bit (or really, a LOT) of pounding the pavements and knocking on door (and there is plenty of that), there is also a wild card in there that, well, just reeks of how we're doing crime in the 21st century. The Kinks have a good song about that; "Everybody's a dreamer / and everybody's a star /everybody's in showbiz / it doesn't matter who you are..."
Jake Halpern is really on to something in this book. I can't want for his next one. You can download your own personal file about stolen Excel files by following this link to the MP3 audio file. Here's the one-hundred ninety-third episode of my series of podcasts, which I'm calling Time to Read. Hitting the two-year mark, I'm going to make an effort to stay ahead, so that podcast listeners can get the same sort of "sneak preview" effect that radio listeners get each Friday morning. This week, I seem to be on top opf the game, but who knows what the hell might happen. I am hoping to stay back up and stumbling. Stumbling is obviously the key word here, but I am trying to keep up with projects in the future as well as catch up with projects in the past. My apologies to Brian and the other Europe interviews that are taking so long to edit and get posted. I'm trying folks! The one-hundred ninety-third episode is a look at Jake Halpern and 'Bad Paper: Chasing Debt from Wall Street to the Underworld.'. 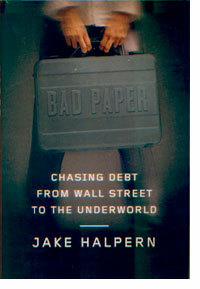 Here's a link to the MP3 audio file of Time to Read, Episode 193: Jake Halpern, 'Bad Paper: Chasing Debt from Wall Street to the Underworld.'. "I read no book reviews any more; the level of discussion is really pedestrian." "I'm just saying it's a conflict of interest!" 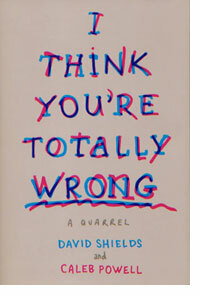 I had so much fun talking with David Shields and Caleb Powell about their book, 'I Think You're Totally Wrong,' that it almost undermined the idea of the book being a quarrel And as an interviewer, these two made my job supremely easy when they weren't making it unexpectedly hard. I'm just as lazy as the next guy, so one of the reasons that I dragged my heavy gear out to Union Square, parked in the bowels of the garage there, and then hauled the leaden cases up with me was that I was hoping for a snowball interview, which is to say that I hoped to be able to make a brief comment and then let the bickering begin. This proved to work reasonably well, once, at least, the two of them built up a head of steam. It was also really, really fun; even while (here comes the dissonance) we were talking about abstract concepts and philosophies. But the interviewees started asking me questions, and in this format, my answers seemed a bit more relevant. I certainly had a few bones to pick with their book. I run a website with all pretty positive reviews. a position that was dissed in the book. As so far as that goes, David Shields had a problem out of the box with my description of him as a polemicist. We had an argument out of the box, which was the point of both the interview and the book. We also had more fun than we all expected, since we ran an easy hour. This is a dangerous interview. It will make you think strange thoughts and make you want to buy the book to craft stranger and stronger thoughts and disagreements with yourself and the world at large. Let me thank the authors for being so generous with the time and twitchiness. Prepare to quarrel by following this link to the MP3 audio file. Here's the one-hundred ninety-second episode of my series of podcasts, which I'm calling Time to Read. these days I actually sort of perform them with the writers as a "lightning round" (thanks David Rich!) after the longer interview. I try to keep these lighning round interviews under four minutes, for a radio-friendly format. If you want to run them on your show or podcast, let me know. This edition of Time to Read includes two bits in one. It's entirely unedited, in keeping with the live format of the book. And it's 12 minutes long. My hope is that (generally) in under four minutes I can offer readers a concise review and an opportunity to hear the author read from or speak about the work. I'm hoping to offer a new one every week. 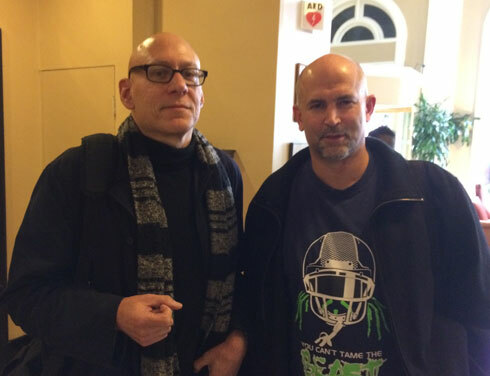 Here's a link to the MP3 audio file of Time to Read, Episode 192: David Shields and Caleb Powell, 'I Think You're Totally Wrong'.